In the past, fly ash was generally released into the atmosphere, but air pollution control standards now require that it be captured prior to release by fitting pollution control equipment. 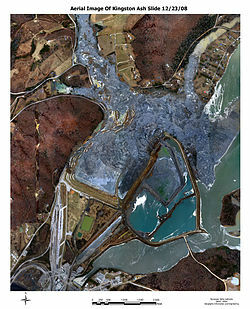 In the United States, fly ash is generally stored at coal power plants or placed in landfills. About 43% is recycled,  often used as a pozzolan to produce hydraulic cement or hydraulic plaster and a replacement or partial replacement for Portland cement in concrete production. Pozzolans ensure the setting of concrete and plaster and provide concrete with more protection from wet conditions and chemical attack. The recycling of fly ash has become an increasing concern in recent years due to increasing landfill costs and current interest in sustainable development. As of 2005 [update], coal-fired power plants in the US reported producing 71.1 million tons of fly ash, of which 29.1 million tons were reused in various applications. If the nearly 42 million tons of unused fly ash had been recycled, it would have reduced the need for approximately 27,500 acre⋅ft (33,900,000 m3) of landfill space. Other environmental benefits to recycling fly ash includes reducing the demand for virgin materials that would need quarrying and cheap substitution for materials such as Portland cement. Owing to its pozzolanic properties, fly ash is used as a replacement for Portland cement in concrete. The use of fly ash as a pozzolanic ingredient was recognized as early as 1914, although the earliest noteworthy study of its use was in 1937. Roman structures such as aqueducts or the Pantheon in Rome used volcanic ash or pozzolana (which possesses similar properties to fly ash) as pozzolan in their concrete. As pozzolan greatly improves the strength and durability of concrete, the use of ash is a key factor in their preservation. Fly ash can significantly improve the workability of concrete. Recently, techniques have been developed to replace partial cement with high-volume fly ash (50% cement replacement). For roller-compacted concrete (RCC)[used in dam construction], replacement values of 70% have been achieved with processed fly ash at the Ghatghar dam project in Maharashtra, India. Due to the spherical shape of fly ash particles, it can increase workability of cement while reducing water demand. Proponents of fly ash claim that replacing Portland cement with fly ash reduces the greenhouse gas "footprint" of concrete, as the production of one ton of Portland cement generates approximately one ton of CO2, compared to no CO2 generated with fly ash. New fly ash production, i.e., the burning of coal, produces approximately 20 to 30 tons of CO2 per ton of fly ash. Since the worldwide production of Portland cement is expected to reach nearly 2 billion tons by 2010, replacement of any large portion of this cement by fly ash could significantly reduce carbon emissions associated with construction, as long as the comparison takes the production of fly ash as a given. 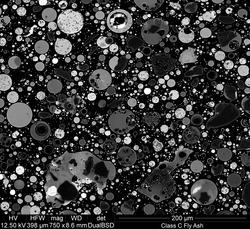 Fly ash properties are unusual among engineering materials. Unlike soils typically used for embankment construction, fly ash has a large uniformity coefficient and it consists of clay-sized particles. 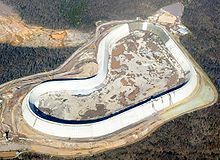 Engineering properties that affect the use of fly ash in embankments include grain size distribution, compaction characteristics, shear strength, compressibility, permeability, and frost susceptibility. Nearly all the types of fly ash used in embankments are Class F.
As the ash weathers, its salinity, boron level and pH all fall; the former two are largely removed from surface layers after 5 years outdoors, while pH declines towards 7 in a generally linear fashion at a rate of about 1 pH unit per 20 years. The floral succession approximates to that of a coastal dune system, without the wind-blown deposition, so salt-tolerant plants are replaced by an attractive sward of legumes and perennials before turning to birch/ willow scrub woodland. A notable feature are the Dactylorhiza orchids which often form spectacular colonies 10–20 years post dumping, only to fade away again as the woodland thickens. Hydroseeding is often used to establish vegetation onto PFA due to the inhospitable conditions of most sites. Material Safety Data Sheets recommend a number of safety precautions be taken when handling or working with fly ash. These include wearing protective goggles, respirators and disposable clothing and avoiding agitating the fly ash in order to minimize the amount which becomes airborne. The Ministry of Environment and Forest of Government of India first published a gazette notification in the year 1999 specifying use of fly ash and mandating a target date for all thermal power plants to comply by ensuring 100% utilisation. Subsequent amendments to the notification in 2003 and 2009 had fixed the deadline to be 2014 which as per figures reported in  was missed by almost 40%. This has resulted in the latest notification in 2015 which has set December 31st 2017 as the revised deadline to achieve 100% utilisation. Out of the approximately 55.7% fly ash utilised, bulk of it (42.3%) goes into cement production whereas only about 0.74% is used as an additive in concrete (See Table 5 ). Researchers in India are actively addressing this challenge by working on fly ash as an admixture for concrete and activated pozzolanic cement such as geopolymer  to help achieve the target of 100% utilisation . The biggest scope clearly lies in the area of increasing the quantity of fly ash being incorporated in concrete. India produced 280 Million Tonnes of Cement in 2016 . With housing sector consuming 67% of the cement, there is a huge scope for incorporating fly ash in both the increasing share of PPC and low to moderate strength concrete. There is a misconception that the Indian codes IS 456:2000 for Concrete and Reinforced Concrete and IS 3812.1:2013 for Fly Ash restrict the use of Fly Ash to less than 35%. Similar misconceptions exists in countries like USA  but evidence to the contrary is the use of HVFA in many large projects where design mixes have been used under strict quality control. It is suggested that in order to make the most of the research results presented in the paper, Ultra High Volume Fly ash Concrete (UHVFA) concrete is urgently developed for widespread use in India using local fly ash. Urgent steps are also required to promote alkali activated pozzolan or geopolymer cement based concretes. ^ Snellings, R.; Mertens G.; Elsen J. (2012). "Supplementary cementitious materials". Reviews in Mineralogy and Geochemistry. 74: 211–278. doi: 10.2138/rmg.2012.74.6. ^ " The Building Brick of Sustainability Archived 2009-06-28 at the Wayback Machine". Chusid, Michael; Miller, Steve; & Rapoport, Julie. The Construction Specifier May 2009. ^ " Coal by-product to be used to make bricks in Caledonia Archived 2010-09-18 at the Wayback Machine". Burke, Michael. The Journal Times April 1, 2009. ^ Scott, Allan N .; Thomas, Michael D. A. (January–February 2007). "Evaluation of Fly Ash From Co-Combustion of Coal and Petroleum Coke for Use in Concrete". ACI Materials Journal. American Concrete Institute. 104 (1): 62–70. doi: 10.14359/18496. ^ Duxson, P.; Provis, J.L. ; Lukey, G.C. ; van Deventer, J.S.J. (2007). "The role of inorganic polymer technology in the development of 'Green concrete'". Cement and Concrete Research. 37 (12): 1590–1597. doi: 10.1016/j.cemconres.2007.08.018. ^ DIRK group (1996). "Pulverised fuel ash products solve the sewage sludge problems of the wastewater industry". Waste management. 16 (1–3): 51–57. doi: 10.1016/S0956-053X(96)00060-8. ^ Earthjustice, 27 Nov. 2018 " New Report Reveals Severe Groundwater Contamination at Illinois Coal Ash Dumps: 22 of 24 of Illinois’ Reporting Coal Ash Dumpsites Have Unsafe Levels of Toxic Pollutants in the Groundwater"